SEC Talks to Industry, Is Bitcoin-ETF a Go? Representatives of an investment firm VanEck, blockchain-company SolidX and CBOE exchange met with the U.S. Securities and Exchange Commission’s (SEC) Elad Roisman and his counsels, to discuss the future of their application for Bitcoin-ETF, which is currently under consideration by the commission. The Memorandum of the meeting, which took place on October 9, came to light only now. The VanEck SolidX ETF application was placed in August, and since then both companies have been waiting for its approval. VanEck during the discussion with the regulator has even prepared the presentation that according to them proves the feasibility of approving the application. In particular, the reasons cited the existence of an extensive regulated Bitcoin derivatives market, the improvement of the system of investor protection and the prevention of market manipulation. SolidX’s previous application for a Bitcoin-ETF was rejected by SEC in May 2017. The main differences in the product they are trying to get approval for now, were said to have been highlighted within the following four items in the presentation. This product is not for regular investors; the average price of a share will be around $200,000. 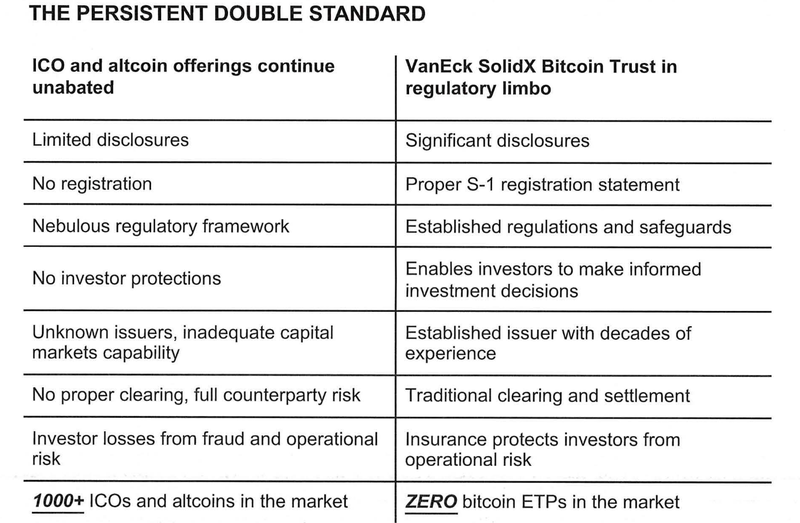 Additionally, the presentation compares ICOs and VanEck & SolidX Bitcoin Trust, side by side to underline the double standard practice by SEC. However, around the issue of Bitcoin ETF, an atmosphere of uncertainty has formed since the U.S. SEC is not in a hurry to unveil their final decision. "We are concerned that the concept of 'essential' is an ever-changing quantity for the SEC. We have not been given an explanation of what is meant by "significant", and this allows them to constantly change the rules of the game." BUT MAYBE THE GAME HAS INDEED CHANGED? Elad Roisman is the first representative of the American financial regulator, who has publicly met with the representatives of the three groups. Beforehand, the applicants had faced the Office of Market Supervision and Division of Trading and Markets representatives. Republican SEC Commissioner Roisman was appointed to his position on September 5. Prior to his appointment, some experts were assuming that the chances for the approval of a bitcoin-ETF will increase significantly after he would take the chair. Roisman repeatedly voiced a view that the U.S. government should provide fair treatment to digital money, ICO, and blockchain. Earlier, only one member of the commission, Republican Commissioner Hester Peirce proved herself as a “good cop” to the crypto community. Prior to the appointment of Roisman, Pierce was the only one who voted “yes” for the Winklevoss Bitcoin-ETF, against the 3 others for a “no” in a system where a majority vote is necessary. Hester Peirce is still willing to grant investors with the opportunity to benefit from a Bitcoin-ETF, as she promised to do her best to change the mind of her colleagues. The other 3 are Chairman Jay Clayton who is independent, however, he was appointed by a Republican president Donald Trump and for all intents and purposes he is a Republican. On Tuesday evening, Democrat Commissioner Kara Stein and the likely possible “NO” vote, in an interview with Bloomberg TV said that the Comission is still undecided over the launch of a bitcoin-ETF. According to her, companies must prove that they can provide the necessary liquidity, physical storage and accurate assessment, despite sharp fluctuations in prices. At the same time, Stein refused to comment on the possible timing of the decision on the application VanEck. According to the rules, the Commission must make it until February 27, 2019. However, Stein will not be able to voice her rejection after December 2018 as her 5-year term and an additional 18 months beyond that will come to an end. The rumors say that she will be replaced with another Democrat member, Allison Lee, but at the time of writing, no official announcement has been made. Also, there can be a chance for a Bitcoin-ETF approval while the position of Stein remains empty until it is being filled by her successor. The potential negative vote will most likely come from the Democrat Commissioner Robert Jackson, Jr. since he voted against Winklevoss application earlier and is known for his relatively low support towards the crypto industry. It's a fair guess to say that this time round the vote may go the other way and given the qualified majority vote system a bitcoin-ETF may get an approval.